The turn off to the proposed Davenport Range National Park is 90 kilometres from Tennant Creek and encompass 1120 sq km’s of land, surrounded by pastoral leases of the Anurrete Aboriginal Land Trust. The many large waterholes provide a refuge for a range of fauna, in particular water birds. Several species of fish live in the permanent waterholes. It is also a quiet refuge for tourists wishing to get off the beaten track. Two places available to visit are Whistleduck Creek and Old Police Station Waterhole. Access is via Kurundi Station to the north of the Devils Mables or via the Taylor’s Creek Road to the north of Barrow Creek. The ‘Frew River Loop 4WD Track’ gives an alternate approach to Old Police Station Waterhole, but is a demanding 17km track for experienced 4 wheel drivers only. This region is home to the Waramungu, Alyawerre and Kaytetye people. 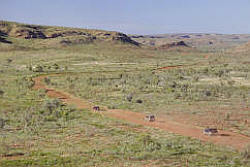 Aboriginal ties to this land are very strong, with the Ranges featured in many Dreamtime stories. Europeans settled here over 100 years ago, for mineral exploration, pastoral development, missionary work and government services such as the Police Station. Camping facilities are basic and you will need to bring all your supplies with you. Maps can be obtained from all information centres or Parks and Wildlife offices. Road conditions can be obtained by phoning the Ali Curung Police Station on (08) 8962 1959. For further information, visit Parks and Wildlife.